Discover why Austin in Texas, USA, ranked #70 in our countdown of ‘100 Most Incredible Cities in the World’. South By Southwest (SXSW) music festival. Austin is the most un-Texas city in Texas, with a plethora of green open public spaces, recycling initiatives and enviro projects; and protests against big condo developments. 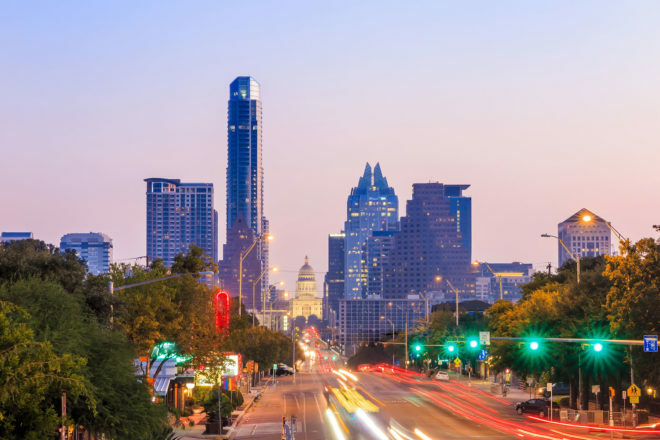 The second-fastest growing city in the US population wise, it has a cool vibe that plays out in the way the locals eat, drink and have fun: people don’t mind lining up around here for a new foodie experience, in fact waiting in line is part of the Austin social scene. Food trucks are massively hip, with around 600 in the city. Franklin BBQ started as a food truck but is now a restaurant where you can expect a queue every single day until the brisket and pulled pork runs out; bungalow bars are still big here, particularly along Rainey Street, where little houses are converted into bars (think backyards and ping pong tables and drinking on the porch). While SXSW is one of the country’s premiere music festivals, there are copious venues alive every single night with music, with the ones along 6th Street humming with everything from jazz to rock to progressive on offer. There’s even live music at the airport!